Sonatest matches its phased array flaw inspection and detection system with Phoenix ultrasound scanner for high resolution volumetric industrial scanning. 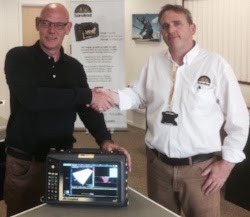 Phoenix Inspection Systems has taken delivery of a veo+ phased array flaw detector from Sonatest. Phoenix will now be able to demonstrate the compatibility of its dynamic range of ultrasonic scanners interfacing fluently with the veo+ to produce high resolution volumetric scans and record precise data sets. Retaining the best features of the established veo line, the veo+ is designed as a smart and future proof asset to meet the continuing needs of businesses. The veo+ and dynamic Phoenix scanners for a powerful combination technicians across industries such as Oil & Gas, Energy and Pipe Weld Inspection.